Let′s have a look. 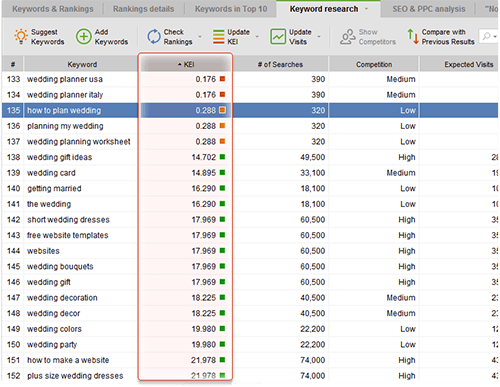 On the right of the keyword tool′s window, find the combo box with workspaces and choose Keyword Research View. Now you can see a column with KEI. In this column, the tool has put a color marker for each word, ranging from green to red. So, What′s KEI and Why Do We Need It? 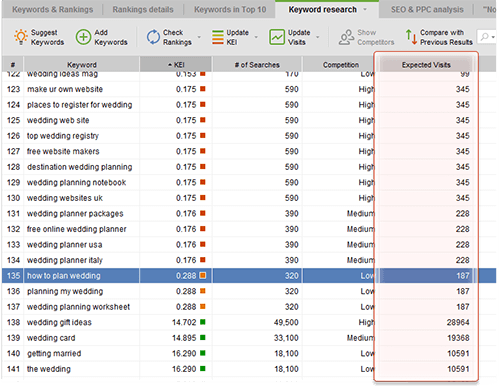 As I already told you, KEI, or keyword efficiency index is an SEO know–how. It shows you how good a keyword is for bringing traffic to your site. Or, putting it simple, how much positive effect keywords have on your paychecks. You need keywords with high KEI. The greener the marker is in Rank Tracker, the better the keyword. So just sort keywords by KEI (click the header of the column), and separate the best keywords from non–worthy ones. And, you can just remove the keywords with bad KEI. Rank Tracker does not only let you estimate KEIs in a click of mouse, but also calculates how much visits this or that keyword may bring to your website i.e. 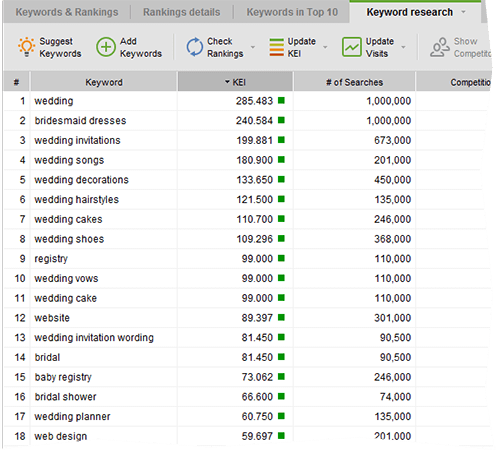 how profitable a ranking for a particular keyword will be. Go check the Expected visits tab and make your choices! Eventually you′ll be left with 100–130 keywords. First, pay attention to the top 5 ones. You′ll use them a lot to optimize your website. The next 30 will be a good alternative, say, to create variations. Then, the remaining terms are good enough and should be there just in case. DO IT NOW! Calculate KEI for your keywords, sort them out and choose 5 best keywords, 30 alternative ones, and leave 65 more to create more variations. Let′s sum it up. You will hardly realize it at the moment, but now you have a list of premium quality keywords that are worth a fortune. As a next step, we′ll check where your site ranks for these words. To put it simple, let′s find our starting point. Thank you for this information. But since september 2016, we don´t have the # of searches because of changes inside of keyword planner. Do you know if there is another way to get this data? Yes, indeed, the changes in Google Adwords Keyword Planner no longer let you see the exact search volume. But we will try to introduce our own custom solution soon that will let you see approximate volume numbers for keywords. Great news!! I am looking forward to know your own custom solution. Thanks a lot! The great interface. I love it. Very Good. Thank So much.! Which indicator should pay the most attention? Expected visits? Hi Dan! If I have a website with two branches of different products (eg sale of computers and sale of smartphones) do you recommend in RankTracker doing two projects keywords separately? I mean, one for computers and one for smartphones? or all toghether in one project? Thanks!! If you have the same site for both computers and smartphones then you can track all your keywords under one project, no need to create 2 separate projects. Hi every body! How to find rank tracker full version for free?